1944 – TRE at Malvern College. 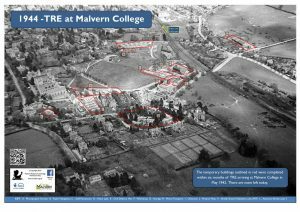 The poster shows the extent of the ‘temporary’ buildings that formed half of the accommodation of TRE in 1944 at Malvern College. The scientists also had laboratories in the main accommodation houses, the Pavilion, and the squash courts. As a part of historic records collected for the Defence of Britain project, M Wilkes compiled a site map with knowledge from an ex TRE employee, Dr Ernest Putley. His map is shown below. The ‘temporary’ buildings were erected in Malvern College grounds during the summer of 1942 and early 1943. Accommodation had to be found for 1500 people including scientists and some of their support staff from TRE , a slightly smaller number from ADRE and 1500 RAF service men and women from the TRE Flying Unit. They began arriving in Malvern in the week of 23rd March 1942. They had been evacuated in great haste from the Telecommunications Research Establishment (TRE) at Worth Matravers, near Swanage on the South Coast by order of the government. Malvern College was the place chosen to accommodate their laboratories. The TRE Flying Unit for radar trials was moved from Hurn airport to RAF Defford, a grass strip reserve airfield for a heavy bomber squadron based at Pershore. The move itself was masterminded by Capt Spencer Freeman who was head of the Emergency Services Organisation. His job was to direct the rapid restoration, after bombing damage, of factories under contract to the three supply services, Ministry of Aircraft Production, Ministry of Supply and the Admiralty. In late February 1942, he was directed by the Cabinet to move TRE and its sister Army establishment, ADRDE to a safe place before the next full moon. After visits to a few unsuitable locations Freeman visited Malvern and spoke to Mr Pettifor, the local officer for the Ministry of Works in Tibberton Road. After some sensitive and rapid decisions in very high places, the result was that Malvern College, local Hotels and private housing was requisitioned under the War Act. Malvern became at restricted area and barbed wire was erected around the College. An army of local builders were contracted to provide the accommodation which include laboratories, a restaurant, a Motor Transport Section, an Engineering Unit and many other ancillary facilities. 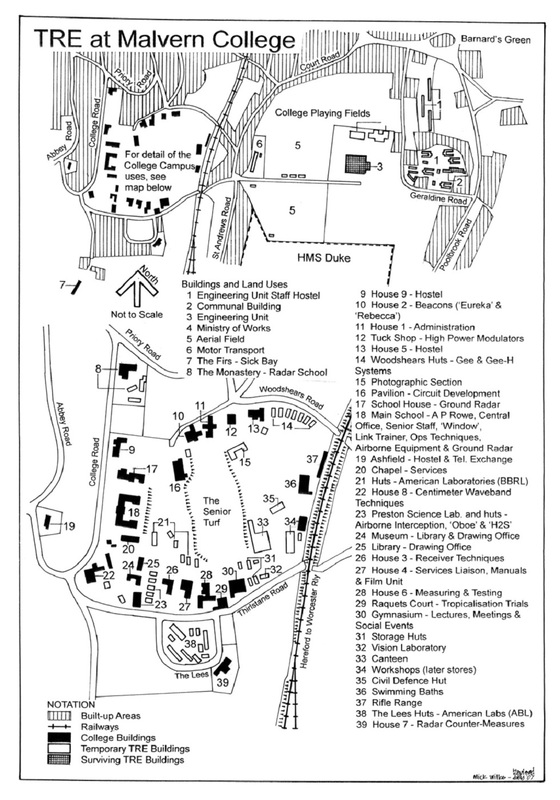 There were two Science Groups attached to TRE from the USA, see the poster Key for locations labelled K and L. You can find more about these Groups by reading the story that accompanies another poster in this series titled ‘1943 – American Scientists arrive at Malvern College’. Production Under Fire, Capt Spencer Freeman, Cahill & C J Fallon Ltd, Dublin, January 1967.